2/13/2009Share this story on Facebook! 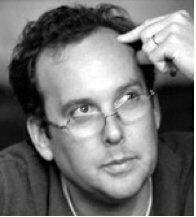 Film critic A. O. Scott conducted a master class at IC in February. Read an interview with A.O. Scott and watch a video of his talk in the Ithacan. "Times Reviewer to Discuss Criticism as an Art Form"
Taibbi first gained a following during his coverage of the 2004 presidential election, which is documented in his critically acclaimed book Spanking the Donkey: On the Campaign Trail with the Democrats. Taibbi is also well known for "Road Rage," his insightful and witty political column in Rolling Stone, as well as for his weekly online column for the magazine called "The Low Post," and for his editorial positions at New York Press and the The Daily Beast website. His speech focused on alternative approaches to a career in journalism, as well as the role of independent media in today's world. A.O. Scott, the prolific film reviewer for the New York Times (Scott logs about 450 pieces a year), was hosted by IC's Department of Writing, as part of their Distinguished Visiting Writers Series. Scott gave a talk entitled “Criticism as a Way of Life” in which he discussed criticism as an approach to the arts and defended the role of the critic. Scott stayed on at IC to conduct a master class on writing. "By studying with different writers in different genres, both individually and in the classroom, students in the master class come to a greater understanding of the art of writing and how its complexities might find reflection in their own work," says Professor Jack Wang, coordinator of the writers series. Tellingly, both journalist discussed the role of bloggers in today's media, and the merits and dangers of a medium where everyone has a voice. "The media terrain is shifting beneath our feet, and IC is trying to keep up with it," says Jeff Cohen, the founding Director of the Park Center for Independent Media. "When independents and blogger/entrepreneurs are winning mainstream journalism awards -- and bringing down a U.S. attorney general, as blogger Josh Marshall did -- this new media landscape needs to be studied and discussed." Both series offer an incredible opportunity for IC students to learn from experienced writers. "It can be depressing for students training for a media career to read of mass layoffs at mainstream media companies," adds Cohen. "It's inspiring for students to meet successful, award-winning, independent journalists who are thriving in today's media."